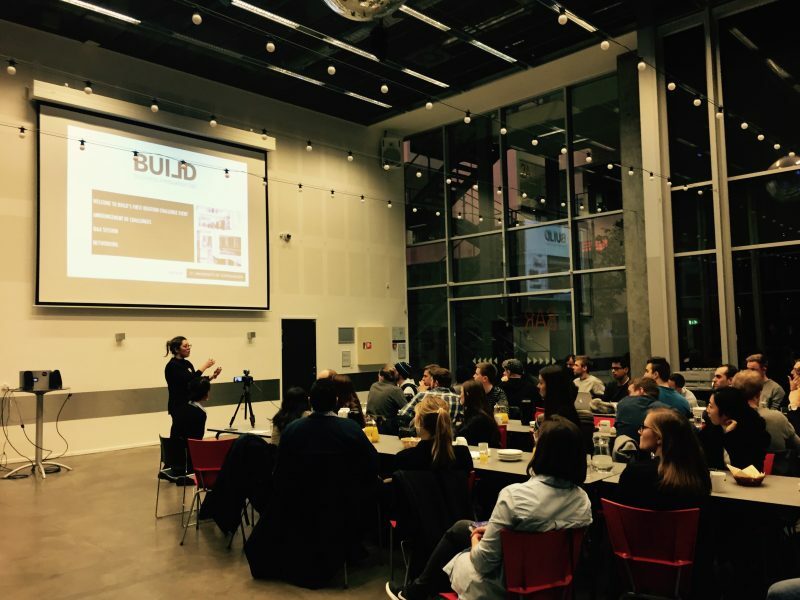 It has been almost a week since BUILD hosted its first Ideation Challenge event and we are pleased to experience the enthusiasm of one very engaged and committed crowd consisting of both students and alumni. GroupM, LEGO Education and ActionAid shared a number of exciting challenges on a mission to involve students into their ways of solving real cases by reaching for knowledge and ideas outside the organisations’ boundaries. Challenge and prize competition are common tool for nurturing innovation, opening up for external knowledge and solving technical, scientific or creative problems often requiring new perspectives and solution approaches. Therefore BUILD would like to aid the collection of ideas by involving a wide and diverse crowd in terms of background and expertise. Ideas can include suggestions, plans and proposals for solutions and can be submitted in the form of solution text, video, prototypes and other media. The challenge extends over a period of two months and will allow students to showcase their capabilities and get rewarded. Make sure to sign up and reach out to us at BUILD if you need support whether for on-boarding after the kick-off, or assistance and mentorship when working on your solutions. Here are the key dates, challenge descriptions and prizes. 24.04 – 11.05 – Evaluation of online submissions. 18.05 – Presentations & final event. ActionAid currently seeks to pilot an innovative and interactive Online Volunteer Portal, VolunteerConnect.online, which would connect ActionAid offices and its 1000 + partner organizations across ActionAid with globally responsible citizens who want to take action through global volunteerism. The desired outcome would be a business plan for how to onboard volunteers to the portal an secure the financial sustainability of the portal over time and the reward for the winning team or individual would be to an invitation to the head office, presentation of the company and current project and interaction meeting with the team working on the project related to challenge. Read more here. LEGO Education has created a closed super-user group currently consisting of teachers (engineers) and parents from around the world. This group has 8 members and LE would like to double that size by end of 2017. Currently the group generate feedback on both our LEGO® MINDSTORMS® Education and WeDo 2.0 solution. They receive access to BETA releases before launch for them to test and provide feedback before we release to market. LE would like participants to create an overview of how the use of crowd sourcing could be optimized and used in LE formal release pipeline. In order words, how does LEGO Education make this an integrated part of the formal workflow and processes? The desired outcome would be to receive input from participants of what they believe is the best way to involve LE’s crowd sourcing solution in the organization’s release pipeline to maximize their input. LEGO Education offers the winning team LEGO® MINDSTORMS® Education EV3 Core Set. Read more about LE’s challenge here. GroupM has presented 3 challenges. The first one is the Dashboard 2.0 where GroupM is looking for solutions to visualize information without using a traditional screen or display. With a rise in connected devices and the ability to make these respond to data input and deliver data output, GroupM is looking for a way to visualize data (preferably in real time) from various data sources in a non-traditional way. A basic example that the company has already tested is a Philips Hue lamp connected to various data sources. By using this, GroupM are able to inform their client (by flashing a certain colour) when sales have been made or prospects are in the market for their brand or products. One of the main questions that GroupM posts related to the Dashboard 2.0 is, if there is any other way the company can develop algorithms and connect systems to visualize data other than using a display. You can read more about it here. The second challenge that GroupM presented is related to augmented reality where the company wishes to explore the opportunities within mobile camera technology and software. Several online platforms are using advanced photo analysis of e.g. photo quality and subject popularity to build connected feeds. GroupM would to test and apply similar technology within media and advertising. This could be through the use of machine learning, visual recognition software or other. The main questions here are, how can technology like this be utilized in modern marketing and how would this technology look like. Here you can view the challenge. The third challenge by GroupM is related to the automation analysis of advertising campaign data. With the use of Natural Language Generation, machine learning and AI, GroupM is looking to explore how to automate the various elements of an analysis – from the beginning of the data discovery to the analysis conclusion by training a system to understand the input and auto-generate a report-like output. GroupM offers an internship as a prize for the first winning place. Find the challenge here. Joining the BUILD’s first Ideation Challenge is for those who would like to develop capabilities by contributing to projects requiring fresh perspectives and novel approaches. Showcasing ideas and receiving feedback on the effectiveness of these, is the main drive for many while being challenged and receiving an award would be the motivation for others. In both cases, BUILD Ideation Challenge is organized to aid innovation and help students apply theory to practice. 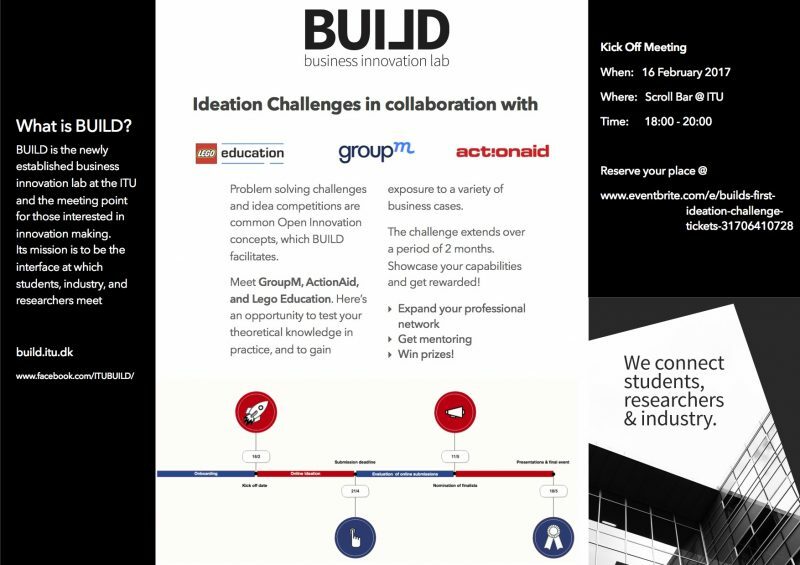 Partake in BUILD’s first ideation challenge Thursday February 16th between 18:00 – 20:00 and meet GroupM, ActionAid and LEGO Education. Reserve your spot here.